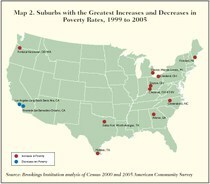 Our friends at the Brookings Metropolitan Policy Program have put out a study looking at where poor people live. It looks at growth in poverty rates and concentration of poverty by region. The point that leaps out, though, is that there are now more poor people in suburbs than in cities. "In 1999 large cities and their suburbs had nearly equal numbers of poor individuals, but by 2005 the suburban poor outnumbered their city counterparts by at least 1 million," write Alan Berube and Elizabeth Kneebone. They also note, however, that big cities were more likely to see big gains in their poverty rates than their suburbs.